One of the biggest challenges facing ambitious software and professional services SMEs in the current economic climate is creating leads for their services in a sustainable manner. 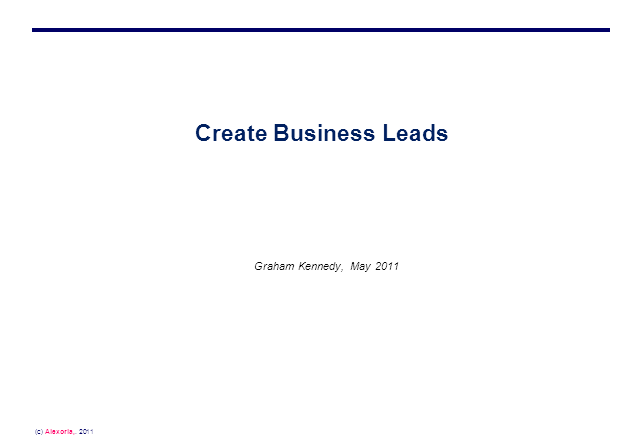 In this presentation, Graham Kennedy of Alexoria will outline the 3 key pre-requisites to be able to generate leads and present a proven, cost effective system that generates leads in a systematic and sustainable way. As a result of using this system, Alexoria now balances demand for its services with the ability of its supply chain to deliver. Graham Kennedy is the founding Director of Alexoria. Alexoria helps enterprise solutions, software, and services businesses (especially SMEs) win more business from the UK Public Sector. Prior to founding Alexoria, Graham worked for Andersen Consulting (now Accenture), leading major IT enabled change programmes, and then for A.T. Kearney, where he led the team that helped position EDS for its $1bn contract extension with DWP. Graham is also the founder and Chair of Intellect’s Innovation Den, which brings together senior personnel from UK government organisations, software and IT services companies and SMEs with the aim of enhancing innovation in the UK public sector.